Hello there, everyone! 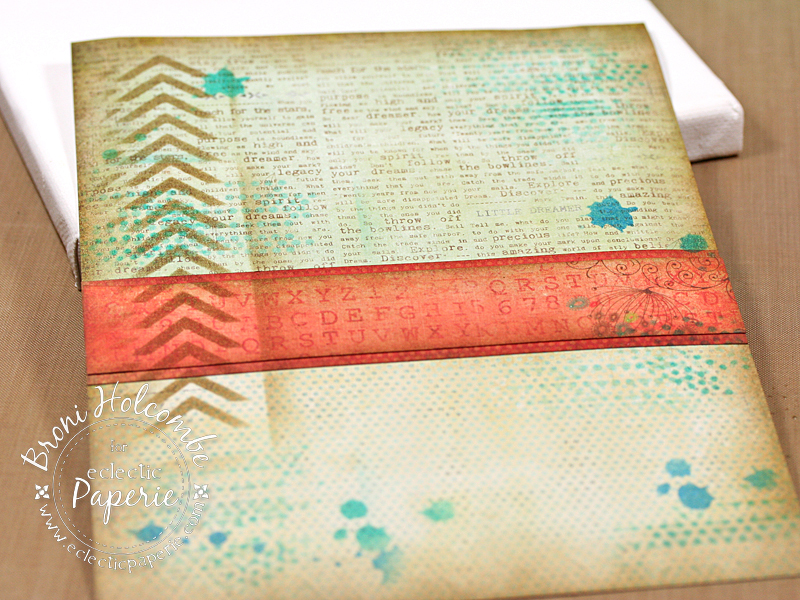 It's Broni here today to show you my entry for this month's eP Get Altered challenge - Game On, that's hosted by the super talented Bonnie! Did you see her awesome altered game board? Wow! I chose to work on a smaller scale - one I'm a little more comfortable with. And my Game On theme is Bingo! 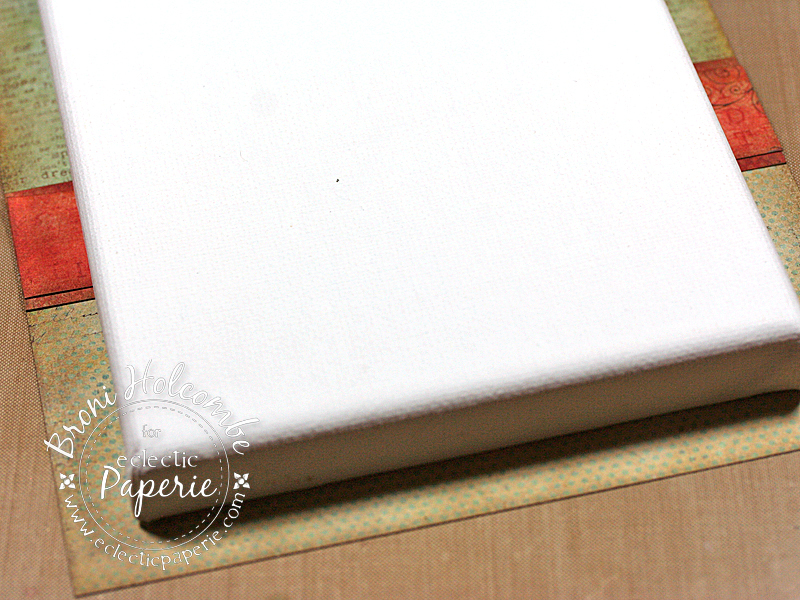 I started with a 5 X 7 stretched canvas and chose some patterned papers that I thought would work well with a beachy theme. 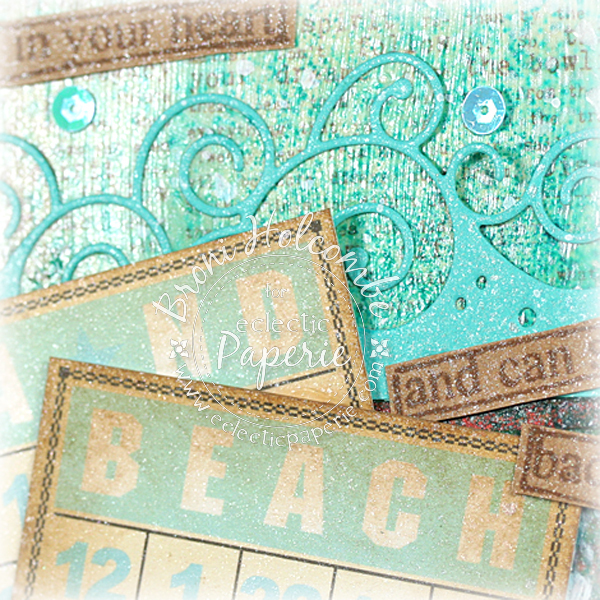 This project is all based around some small Beach themed bingo cards that I had in my stash. 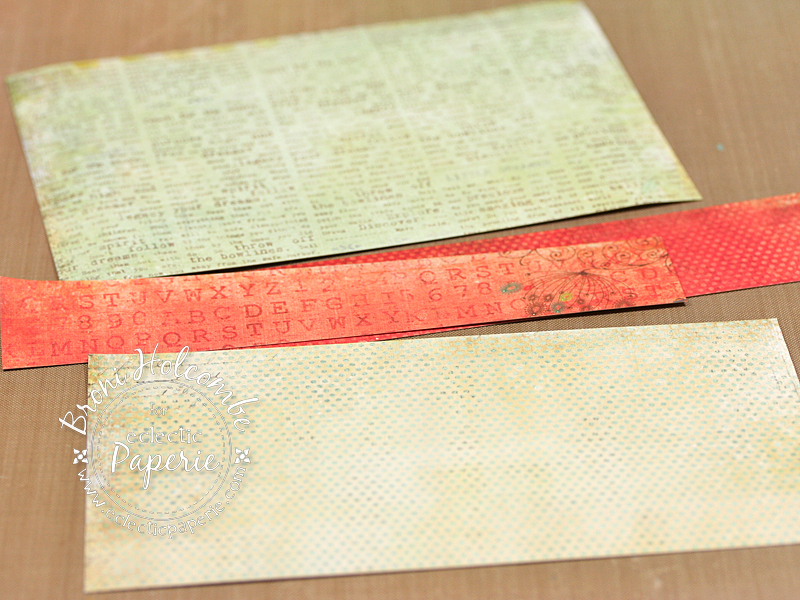 I glued the papers together making sure there was enough to cover the entire canvas, including the sides. 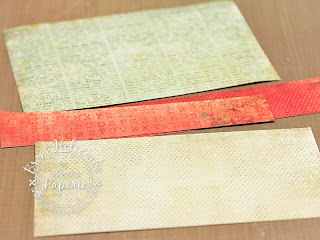 The edges were sponged with Distress Frayed Burlap. Next I sponged on Tumbled Glass, Peacock Feathers, and Salty Ocean using my TCW Tiny Circles and Mini Confetti stencils and then some Frayed Burlap using my Mini Chevrons stencil. I covered the entire back of the papers and the entire surface of the canvas with Claudine Hellmuth Studio Multi-Medium in Matte then adhered them together. I used straight pins to help hold any double layers until the medium was dry. Then I spritzed on some Dylusions Vibrant Turquoise ink spray. When that was dry, I covered the entire surface with another coat of the Multi-Medium and added the die cut wave border while the medium was still a little wet. Then I spritzed once with White Linen ink spray. 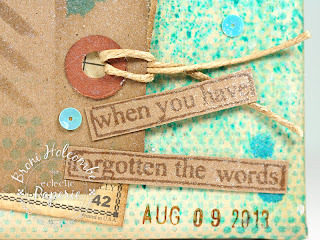 I colored some hemp with Frayed Burlap and added it to my #5 kraft tag that had also been stenciled and had a starfish stamped on it. 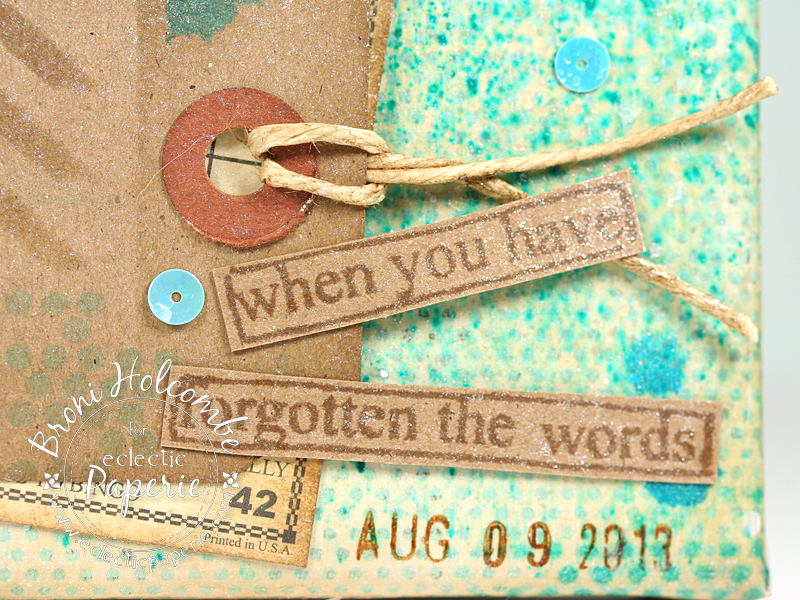 I stamped the Dylusions sentiment from The Right Words on another #5 kraft tag and cut it out to be adhered progressively down the front of the canvas. Then I added the wood bingo number (for the year) and date stamped the canvas at the bottom right. This was really a fun challenge! I hope you'll play along too. There's still plenty of time left to get your entries in! Here's the link to the challenge: Get Altered challenge - Game On! I love this, Broni...my favorite colors, my favorite beach theme...one of my favorite artists! it's the trifecta of happiness! That background is seriously beautiful. WooHoo! 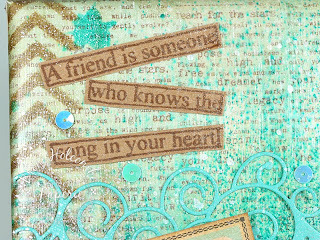 I love this, Broni! 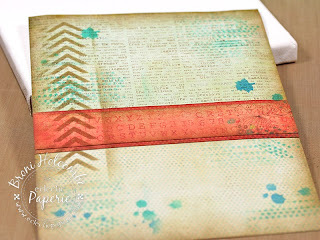 Beautiful colors and a great layout...Amazing! LOVE this beautiful piece! Appreciate the step by step tutorial...helps a newbie like me who loves mixed media and doesn't know quite how to go about it! 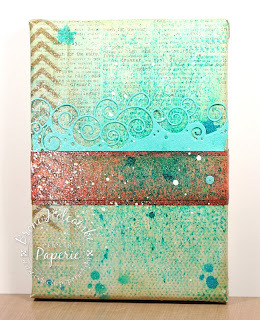 Broni, once again, I love how you incorporated your love of the ocean/beach (the colors) with this fun challenge. Absolutely beautiful. Swoon, the colors are amazing and such a pretty design. I can just picture this in a beach cottage. 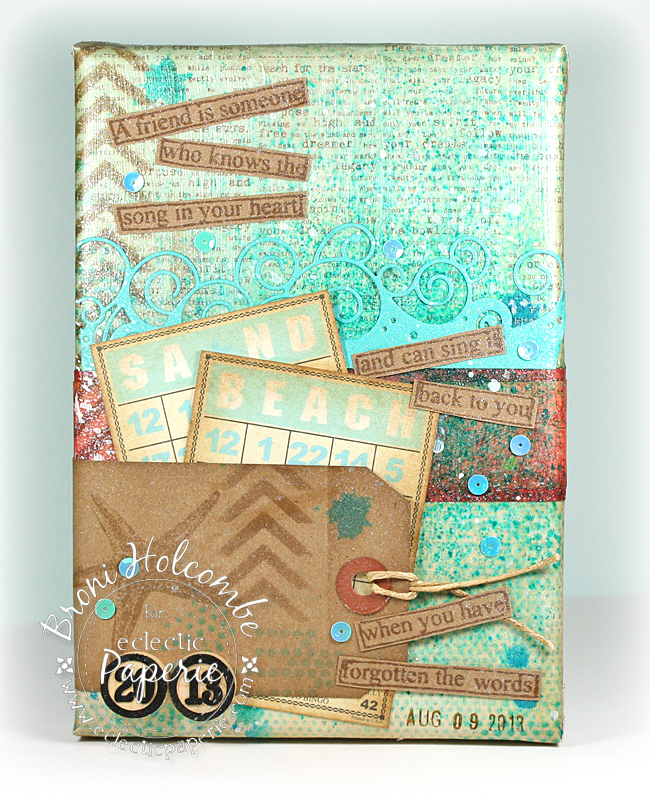 Love the beach theme and your colors are perfect. That is a beautiful quote. 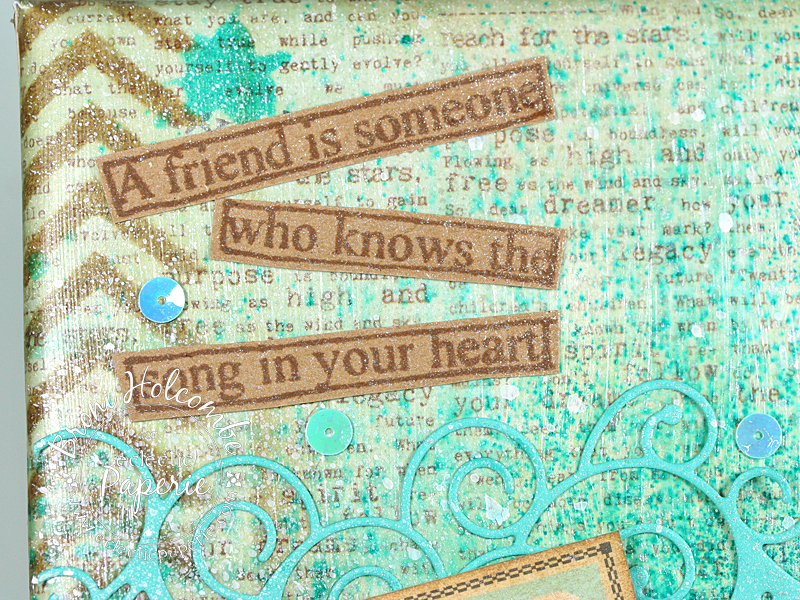 This is absolutely lovely, Broni! 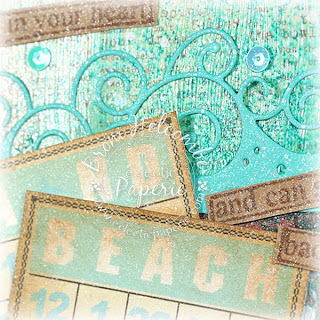 I love your Beach themed bingo cards! This is gorgeous! 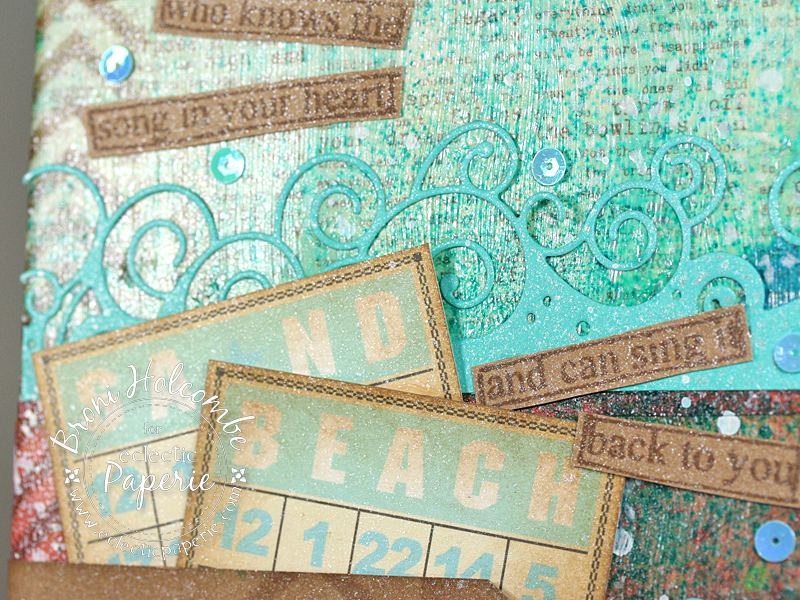 Love those bingo cards and the wave border! 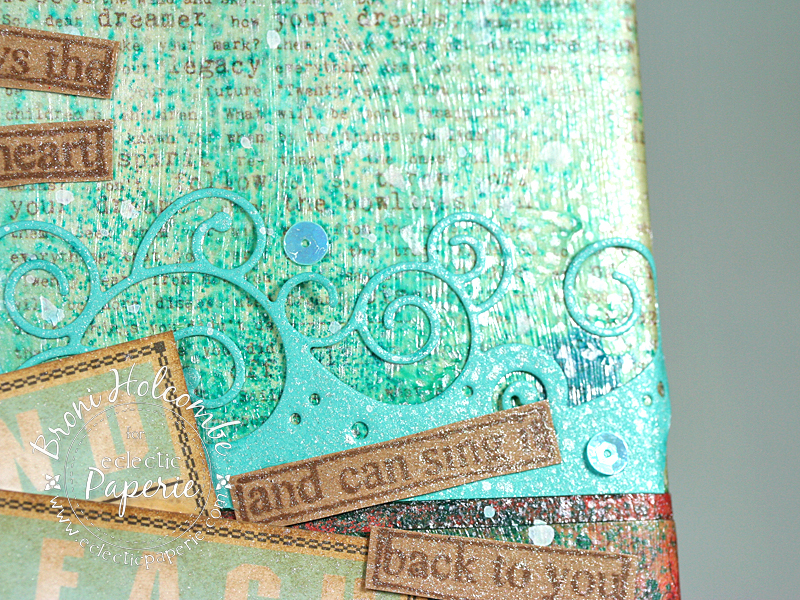 Fantastic combination of color, texture, and elements! Wonderful layers of colour, stencilling and stamping in that gorgeous background, and fab gaming ephemeral - this is so gorgeous! Broni, you have an amazing sense of colour. I love how you combine them to create a soft yet vibrant look. Your layering is fabulous. I love the stencilling and the beautiful elements. The beach and bingo themes are a wonderful combination. Awesome! 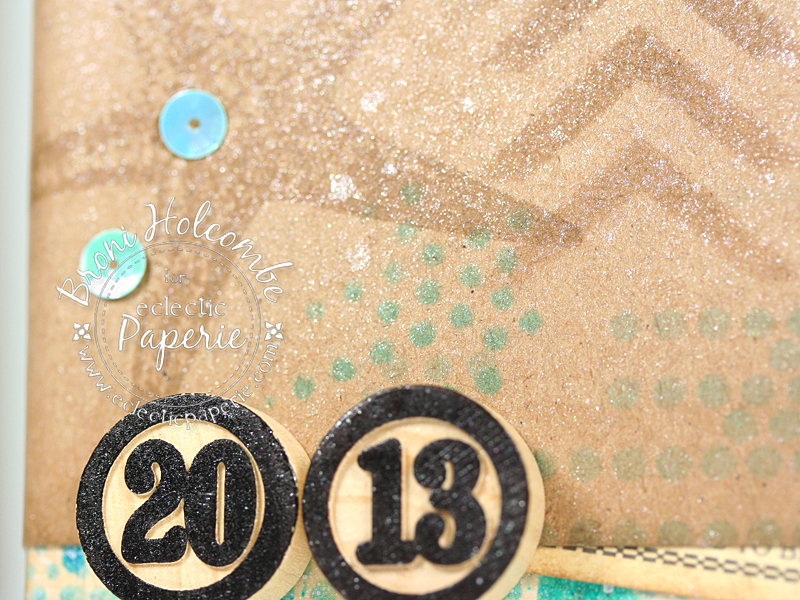 Love the bingo cards, coins and chevron stencil! Great work! 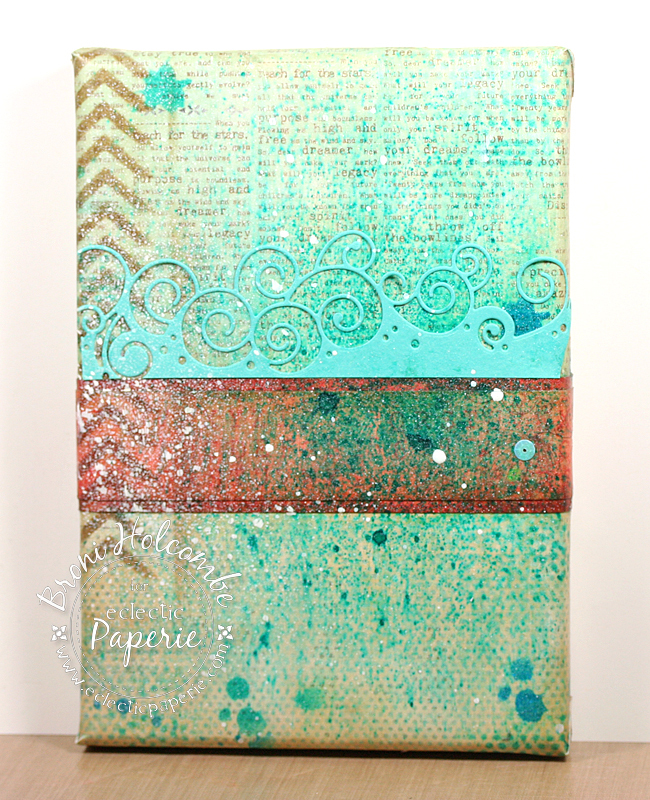 Broni..woohoohoo I am loving your beach themed canvas with all the gorgeous embellishments and the colors are beautiful! !